The Commercial Finance Association (CFA), based in New York, is the international trade group for the asset-based lending industry (ABL). ABL is one of the world’s oldest forms of lending but is often inaccurately portrayed as a “lending option of last resort” only for distressed companies. It is also viewed by some as bordering on predatory lending based on higher historical interest rates and fees. This depiction of the ABL industry is not accurate in the present day. While it is an option for some distressed companies, it is more so a viable, stable and affordable borrowing option for many companies. It is offered by some of the world’s most stable and prestigious banking institutions. Furthermore, ABL is one of the few—if not only—lending disciplines that have grown during the credit market disruption of the past three years. It is not an overstatement to say that ABL has served as a lifeline for thousands of companies in need of critical working capital, yet many of the same historical perceptions of the industry remained throughout much of the business and media world. Bring “ABL to life” and provide concrete examples of its implementation—and success—to truly change perceptions and bring the industry into the mainstream lending conversation. Develop a series of compelling case studies. Pitch top-tier national business media. 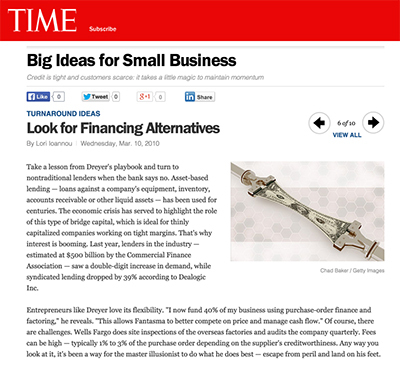 Time feature story, “Big Ideas for Small Businesses”: A series of 10 tips for business owners, CFA and member Wells Fargo were featured in two of the tips. ABL was positioned as a viable option for businesses and it told the story of a Wells Fargo customer who was quoted as saying that without ABL his “sales would have been cut in half” due to an inability to meet demand. New York Times feature story on CFA member Hartsko Financial, focusing on how they have been able to lend to businesses while the credit market in general has retracted significantly. Dow Jones feature article, also reprinted in The Wall Street Journal, focusing on overall growth of ABL and highlights CFA member Cole Taylor Business Credit. Case study publication in weekly business journals in four key geographic markets (New York, Houston, Dallas and Boston). 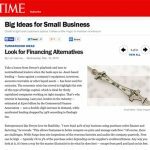 CFA executive quotes and research citation in national business media including Forbes, CFO, Reuters, Associated Press, BusinessWeek, Financial Times, CNBC.com, FoxBusiness.com and Institutional Investor.